The Native Arts and Cultures Foundation (NACF) has awarded its first Mentor Artist Fellowship to 12 artists in three regions of the United States: the Pacific Northwest, Southwest and Upper Midwest. The goal of the Mentor Fellowship is to improve creative development, artistic rigor, and perpetuate intergenerational cultural and traditional knowledge and includes a monetary award of $30,000 per artist; a joint mentor/apprentice art project will be completed during the year long Fellowship. The NACF Mentor Fellowship includes training and requires a joint mentor/apprentice art project at the completion of the one-year Fellowship period. The Fellowship includes a monetary award of $30,000 per artist for a total of $360,000 awarded in fellowships. The Mentor Fellowship Program is generously supported by individual donors and regional funders committed to preserving and perpetuating Native arts and cultures. NACF is piloting the program in 2017. NACF is grateful to Margaret A. Cargill Philanthropies and to the James F. and Marion L. Miller Foundation for supporting an Oregon mentor fellow. The Native Arts and Cultures Foundation’s mission is to promote the revitalization, appreciation and perpetuation of American Indian, Alaska Native and Native Hawaiian arts and cultures through grant making, convening and advocacy. To date, NACF has supported a total of 251 awards for Native artists, organizations, and advocacy efforts in more than 30 states and the District of Columbia. 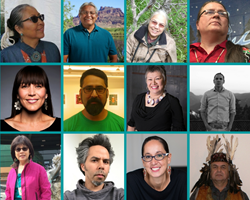 To learn more about the National Artist Fellows and NACF’s work—nurturing the passion and power of creative expression, visit: http://www.nativeartsandcultures.org. NATIVE ARTS AND CULTURES FOUNDATION, INC.